Barça Lassa have defeated Oliveirense 7-6 in an absolute corker of a European League fixture, especially the first half, which saw the teams score ten goals between them. Preceded by an emotional tribute to Aitor Egurrola on occasion of his twenty years in the first team and with Pablo Álvarez side-lined at the last minute with gastroenteritis, the win puts Barça top of Group A in the competition. João Rodrigues (3), Pau Bargalló (2), Matias Pascual and Nil Roca scored the goals. Barça went behind twice in the first quarter of an hour, but found an answer each time, and their Portuguese visitors also replied when Barça finally went ahead. So that was 3-3, and the 2,946 souls in the Palau Blaugrana were loving the entertainment. Barça then advanced to 5-3, with Aitor Egurrola saving a penalty, but Oliveirense had fought back to 5-5 by the end of a pulsating first half of hockey. The second half threatened to be as manic as the first, with a quick exchange of goals making it 6-6, but that was the end of the goal flurry. 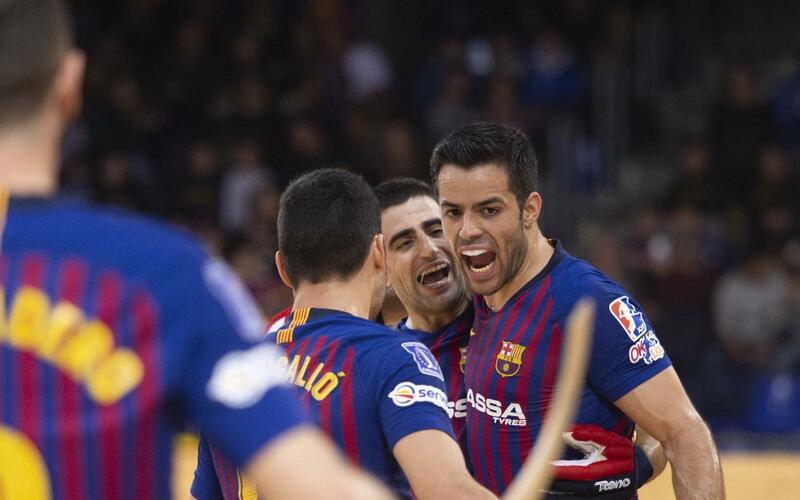 The only other score of the game was a João Rodrigues penalty, and further heroics from the man of the evening, Egurrola, meant Barça Lassa held on to claim the three points. Barça Lassa: Aitor Egurrola, Marc Gual, Matias Pascual, Pau Bargalló, Sergi Panadero, João Rorigues, Matias Pascual, Nil Roca & Ignacio Alabart. Oliveirense: Xevi Puigbí, Xavi Barroso, Marc Torra, Jordi Bargalló, Jorge Silva, Pedro Morreira, Ricardo Barreiros, Emanuel Garcia & Pablo Cancela. Goals: 0-1, Torra (min 2); 1-1, João Rodrigues (min 7); 1-2, Marc Torra (min 10); 2-2, Matias Pascual (min 14); 3-2, Nil Roca (min 15); 3-3, Ricardo Barreiros (min 20); 4-3, Pau Bargalló (min 21); 5-3, Pau Bargalló, p. (min 25); 5-4, Marc Torra (min 24); 5-5, Jorge Silva (min 25); 6-5, João Rodrigues (min 28); 6-6, Jorge Silva (min 33); 7-6, João Rodrigues (min 45).